Collected after reflecting on our team’s work with clients. We co-authored these customer experience touchpoints to capture and consolidate some elements of the Blue Like Neon approach to customer experience and branding. Rooted in our first-hand client interactions and fed by our interdisciplinary digital expertise, we hope something you read resonates, informs and inspires you. 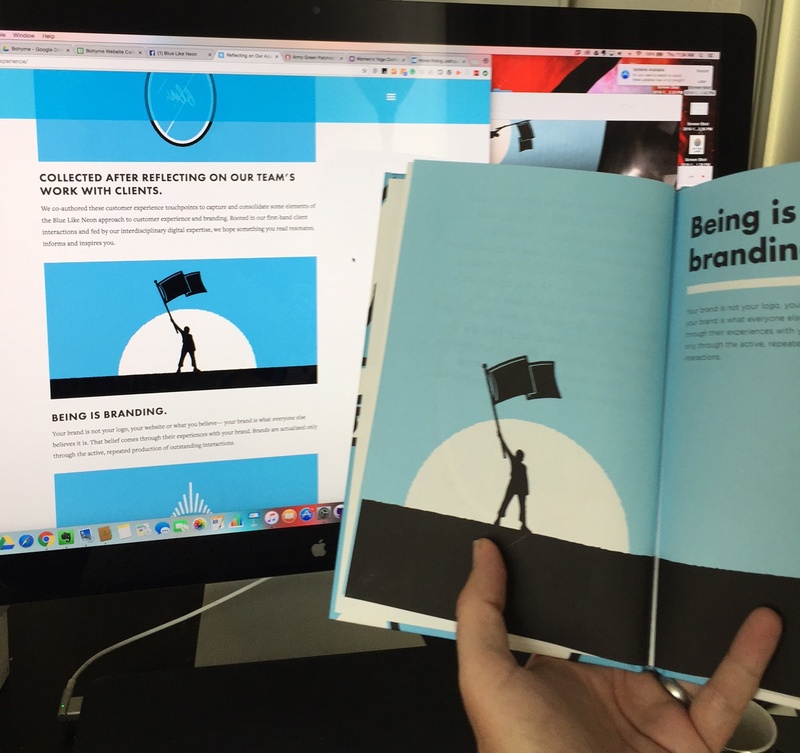 Your brand is not your logo, your website or what you believe— your brand is what everyone else believes it is. That belief comes through their experiences with your brand. Brands are actualized only through the active, repeated production of outstanding interactions. See what our clients see. We can only learn so much from reading websites or marketing materials. Experiencing the brand from our client’s perspective and visiting them on their turf allows us to speak with true understanding. Then, we can help them understand what their customers see and experience. Learn what people really want and give it to them. Don’t assume you know what your customers want. Ask, learn and evolve to improve your relations with customers and the work you do for them. Then, do it again and again. It’s what we do with clients. And it works. By telling a compelling brand story, you can engage consumers’ or clients’ curiosity. A great story is what elevates a brand from just selling products or services, to something that captivates the imagination. People go from just buying, to engaging and being part of something important that inspires themselves. Strive to create experiences that become a customer’s standard for other experiences. Memorable experiences resonate, influencing long term customer choices and loyalties. Do it right each time you do it and it pays dividends. Say it, do it, and deliver. Clients and customers will not recommend your products or services if their experience is bad. The ability to fulfill commitments is the cornerstone of all business. If you promise it, be able to deliver it. And, whenever possible, exceed their expectations. Providing a standard offering won’t retain clients or grow your knowledge base. We strive to learn and create value for our clients by providing them ideas that they weren’t expecting. It’s one way we practice what we preach. If we can’t create value in unexpected ways, how can we expect them to? Data without creativity is just information. Creativity without data risks being beautiful but uninformed. Data and creativity, when paired harmoniously, are rich with insights and value. Work to find the intersection, that is where the magic happens. Make friends with machines, but don’t treat your customers like machines. Machines learn quickly and help in so many ways. We do too. The diff erence is that we also connect. We build relationships and nurture them. Don’t make people feel like they are doing business with a robot that goes through the motions but lacks a soul. The experiences you create for your audience directly affect your business success. Every interaction, then, is an opportunity to engage, increase trust, inspire, improve satisfaction and build loyalty. Together, those experiences build your brand. You can either let it happen to your brand, or you can proactively build it through thoughtful, powerful actions. We work with brands to uncover new opportunities — digital touchpoints — to better serve their customers. What we build then informs the next sets of learning. With these continually revealed insights we measure, learn and respond to discover how our clients can take better care of their customers and grow their business. Our clients care deeply about their customers. We love that about them. We care deeply about their success. Through our work together, they come to understand that leaving experiences to chance is far too risky in our ever-expanding, ever-changing digital world. We strive to create great experiences and doing so positively affects the outcomes of our clients. Blown away Blue Like Neon team. So Proud to be a part.